Many of the Syrians who moved to Turkey started various kinds of businesses that provide immigrants with numerous job opportunities. These businesses were soon able to compete with a number of Turkish businesses and gained popularity among both Turks and Syrians. The Turkish government also tried to provide attractive and suitable conditions for Syrian businessmen and investors inside Turkey by facilitating the process of obtaining export-import licenses in cities such as Istanbul and Gaziantep. Thanks to the availability of the necessary raw materials and large concentrations of Syrian refugees, Istanbul, Mersin, and Gaziantep have become the centers of investment for Syrians. Syrian companies and workshops are scattered about in Istanbul, Gaziantep and Mersin, and cities closer to the border with Syria such as Urfa and Antakya, where there are big numbers of refugees. Mersin enjoys a strategic location as a wealth of raw materials comes into the region from other countries. Many Syrian capitalists have integrated themselves into the Turkish market and their products are beginning to compete with those of their Turkish counterparts. Syrian refugees are no longer confined to the professions they held in Syria. Ali al-Ahmad, the owner of a packaging tea workshop in Antakya told El Gherbal, "back in Syria, I had a tailoring workshop for men's clothing, but after I moved to Turkey in 2013, I thought it was best if I started a new business." He added that many Syrian industrialists also moved their factories and equipment to Turkey and continued working their old jobs. Ahmad said that his products can compete with Turkish ones because he is happy with smaller margins of profit and is willing to offer his products at lower prices, hinting that his Turkish rivals do not feel comfortable with his presence. There are tailoring and embroidery workshops in Istanbul and Gaziantep where small traders work. The Syrians are also well represented in food industry, as many are in the business of producing canned food and potato chips in Mersin. In the leather industry too, Aleppan industrialists compete with Turkish industrialists, especially in the business of manufacturing shoes. Restaurants count among the most important areas where Syrians have started successful businesses in Istanbul and Gaziantep. 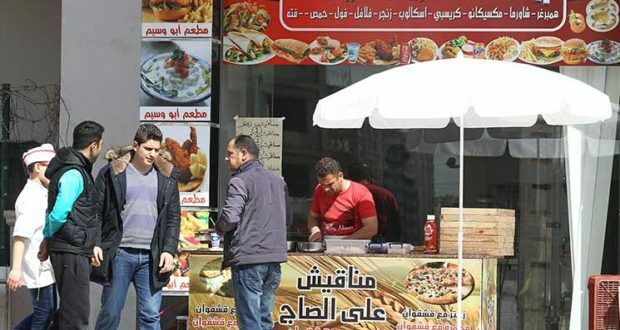 This line of business is very popular among Syrians and also the Turks who have started to develop a liking for Syrian food. Umm Mohammed, a Syrian woman from Aleppo, makes popular Aleppan dishes. She has put to work many young men who deliver those dishes to her customers all around Gaziantep. Umm Mohammed turned her small house into a kitchen. She cooks daily meals for the civil community organizations who sell each dish for 10 Turkish liras. Other investors have also opened restaurants that serve famous dishes from Aleppo and Damascus. Gaziantep is the destination for the people of Aleppo, while Istanbul is home to the people of Damascus. Sultan Mohammad Fateh area especially stands out as a place where tens of the restaurants serve better quality Damascene dishes than those served in Turkish restaurants. Syrians' economic dynamism in Turkey has led to the creation of numerous job opportunities with good wages, improving the lives of thousands of families who depend on what they earn from their freelance and odd jobs. Most small businesses in Turkey such as restaurants, food industries, and tailoring and embroidery workshops tend to hire Syrians. These people work for about nine hours a day on an average income of between 1,400 and 1,600 liras a month ($390-$447). Abu Firas, an embroidery workshop-owner told El Gherbal, "All my employees are Syrians, and I always look for those in need to offer them a job so that they won't use illegal methods to support themselves. Also, Turkish workers will not work for the low salaries paid to Syrian workers."